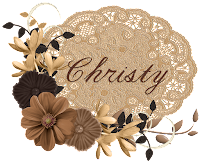 I'm continuing with my Fall Theme Week today. 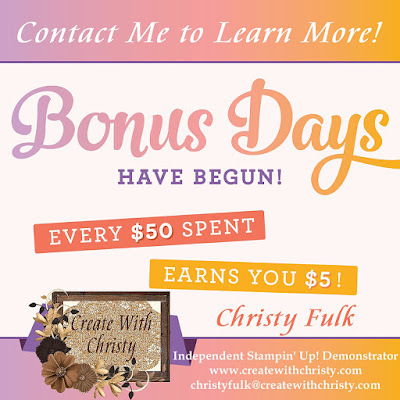 The card features the Winter Woods Stamp Set in the Stampin' Up!® Holiday Catalog. Yes, this stamp set can be used for other than Christmas/Winter. 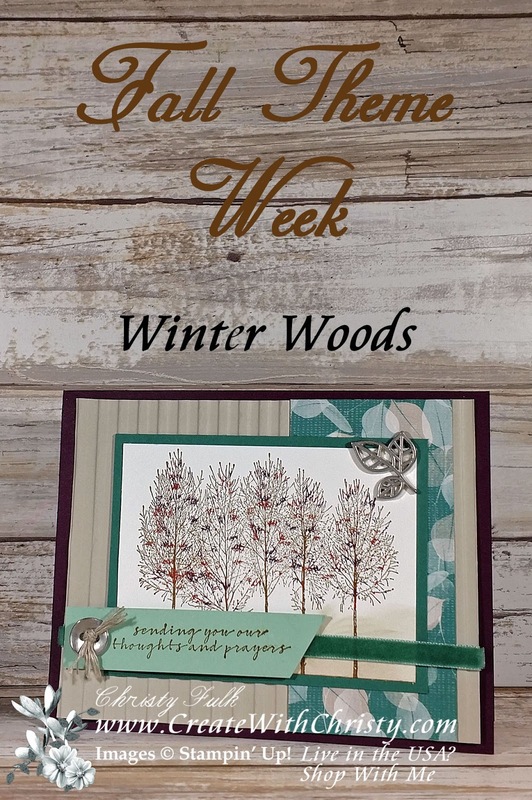 You can also bundle it with its coordinating dies set, In the Woods Framelits, and save 10%. I didn't use the dies on this card, as you can see. 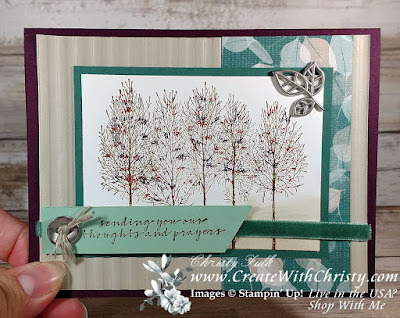 After inking the trees stamp with Soft Suede ink, I "thumped" all over the trees with Blackberry Bliss & Cajun Craze markers (using the brush tip end) from the Regals Collection Stampin' Blends to make them look like Fall trees. 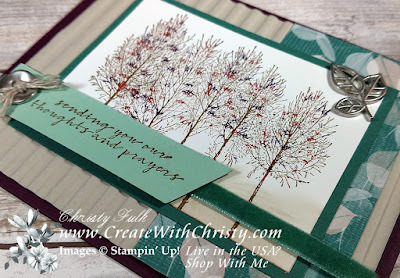 I paired it with the Nature's Poem Designer Series Paper from the Stampin' Up! Annual Catalog. 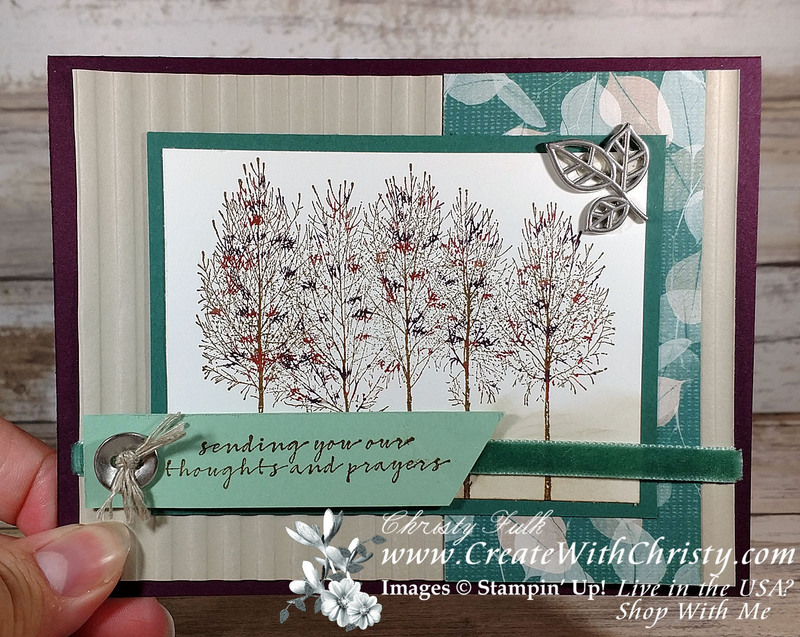 This stamp set coordinates perfectly with the Rooted In Nature Bundle and Lovely As a Tree Stamp Set in the Annual Catalog. Nature's Poem Designer Series Paper (DSP): 2" x 4"
3/16" Braided Linen Trim: 3"
Tranquil Tide 1/4" Velvet Ribbon: 7"
Emboss the Sahara Sand piece by running it through the Big Shot with the Corrugated Dynamic Textured Impressions Embossing Folder. Attach the DSP piece across the right side of the embossed piece (see picture). 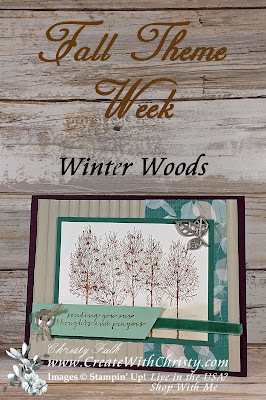 Ink the tree row stamp from the Winter Woods Stamp Set with a Soft Suede Classic Stampin' Pad. Thump the side of the brush-tip of the Cajun Craze marker from the Regals Collection Stampin' Write Markers randomly over the tree branches. Then do the same with the Blackberry Bliss marker. Stamp the trees onto the center of the Whisper White piece. Sponge across the bottom of the tree piece using a Sponge Dauber and ink from the Sahara Sand Classic Stampin' Pad. Attach the piece to the center of the Tranquil Tide piece. Attach the piece to the center of the embossed piece. Wrap the velvet ribbon around the bottom of the embossed piece, and over the bottom of the tree piece, and attach the ribbon ends to the back of the embossed layer. Fold the Blackberry Bliss piece in half (fold on the top) to form the card base. Attach the embossed piece to the center of the card front. Trim the right end of the Mint Macaron piece at an angle. Stamp the "sending you our thoughts..." stamp from the Wishing You Well Stamp Set onto the right end of the piece using the Soft Suede ink pad. Thread the linen thread through the holes in the Galvanized Button, and tie it onto the button using a single knot. Trim the ends,and separate the braided ends until they are loose strands. Attach the button to the left end of the greeting strip using a Mini Glue Dot. 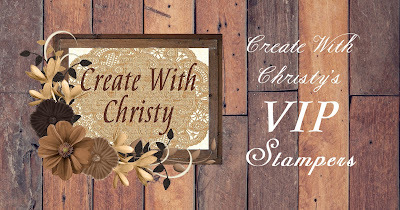 Attach the greeting strip to the bottom, left side of the card, over the velvet ribbon using Mini Stampin' Dimensionals. Attach a silver leaf trio embellishment from the Leaves Trinkets onto the top right corner of the tree layer using a couple Mini Glue Dots.